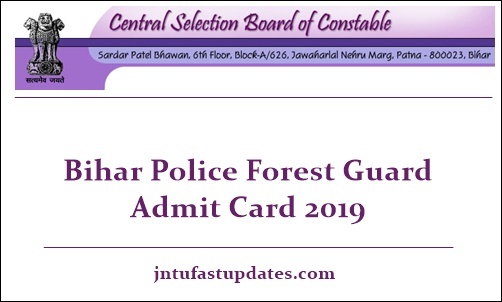 Bihar Police Forest Guard Admit Card 2019: Central Selection Board of Constable, Bihar has scheduled the forest guard written test in the month of February. All the hopefuls applied for the forest guard posts must get ready to attend the written test round. The competition is higher for Bihar Police Forest Guard posts this year. Candidates who are competing for police forest guard posts must clear the written test round with good merit to shortlist for the next rounds of selection process. Candidates have to download Bihar Police Forest Guard hall ticket 2019 to attend the examination. The admit card is the most required document to proceed with the examination. Candidates with admit cards will only be allowed to the examination. If anyone forget to carry, lost the admit cards, he will not be allowed to attend the test. Competitors applied for Bihar Police Forest Guard posts can visit the CSBC official website, csbc.bih.nic.in to download the hall tickets. Or directly click on the hall ticket download link provided below.